If I tell you that Indian restaurants in the UK are usually owned by Bangladeshis and hence serve Bengali food then anyone who knows my preference for Indian takeaway at home will immediately know that I really loved the food in Bangladesh! 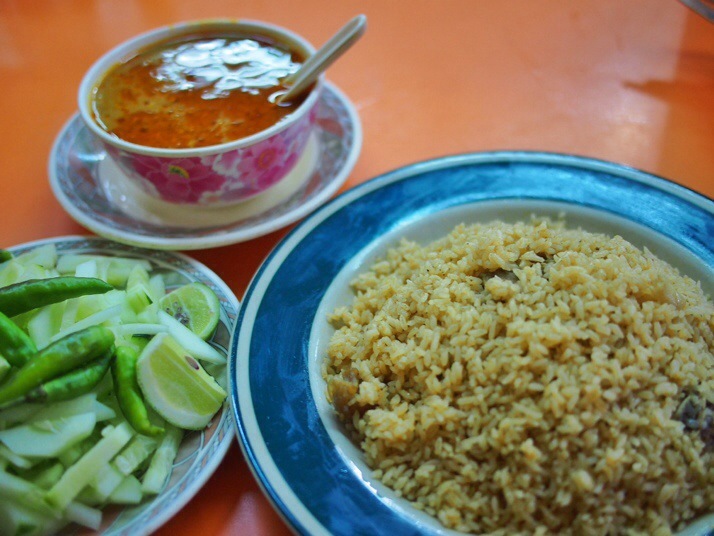 We found the food to be more mellow and with a more rounded flavour than the bright and sharp tastes of the SE Asian countries, and while it can still pack a punch it wasn’t anywhere near as chilli packed as some of the dishes we tried in Thailand. After travelling through the almost bread-free zone of eastern Asia where if you get bread at all it is sweet and with an almost cakey texture, it was great to find bread on the menu again. 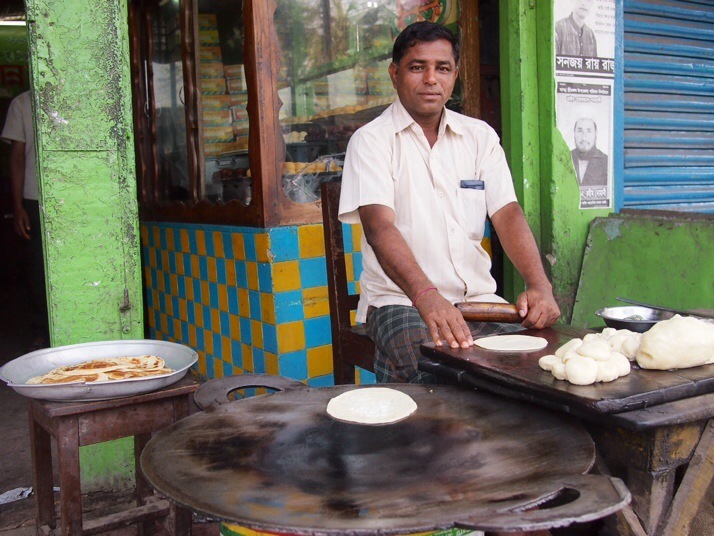 In Bangladesh, flatbreads are eaten at all times of the day and are often cooked on the street outside the restaurant. We came across three main types. Rotis are flatbreads cooked without fat, they’re soft and a nice way to scoop up your curry. Parathas were perhaps the most common, again flatbreads but this time fried on a griddle and sometimes with delicious flaky layers like a good puff pastry. 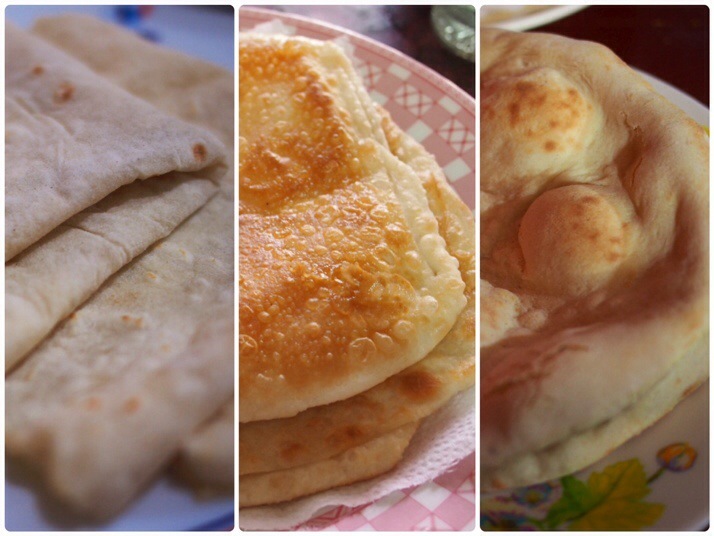 Finally, Andrew’s favourite the naan roti which is cooked stuck onto the inside of a domed oven and puffs up nicely. Curry type meals in restaurants are generally served with rice unless you specifically ask for bread and a whole plate of plain boiled rice will be placed in front of you with the meat and/or vegetables served in separate small dishes – a difference to the UK where the meat is very much the main part of the meal, here it is just enough to taste, an indication of the expense of meat compared to the amount an average Bangladeshi has to spend on their meal. Biryanis were available all over and were a delicious and filling meal. 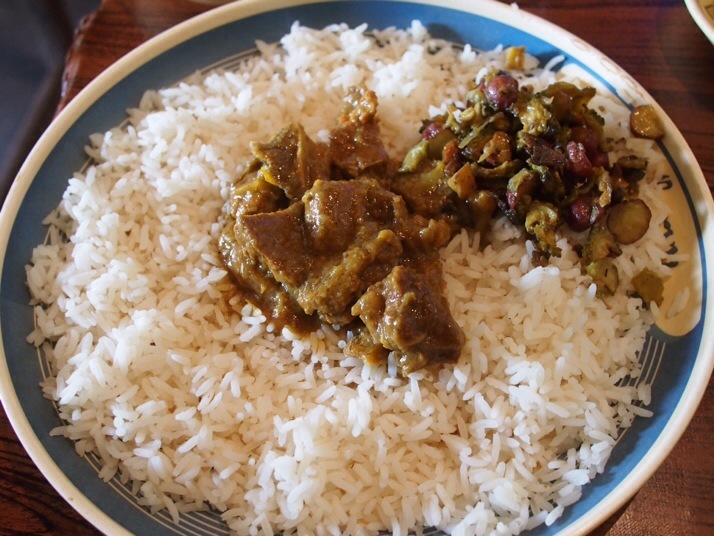 The rice is fried with a small amount of meat (mutton, chicken or beef) and served with a side of curry sauce. Dal, or curried lentils, became a mainstay for us during the month. Breakfast was usually parathas, dal and mixed vegetables. 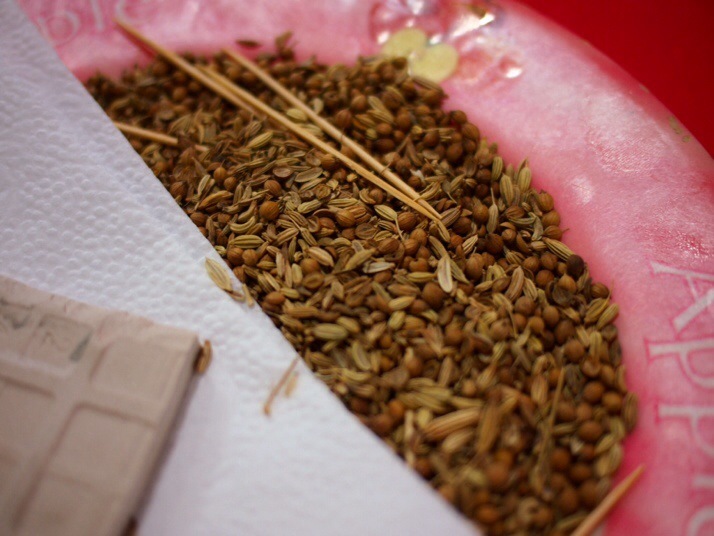 The lentils used were often chana dal (split chickpeas) but split mung beans were also common. It’s usual to have a side of dal with a more substantial meal too to moisten that mountain of rice. We saw a bean stew being served up from street stands on a couple of occassions too but otherwise beans didn’t seem to be commonly used. Surprising to us was the prevalence of cucumbers. 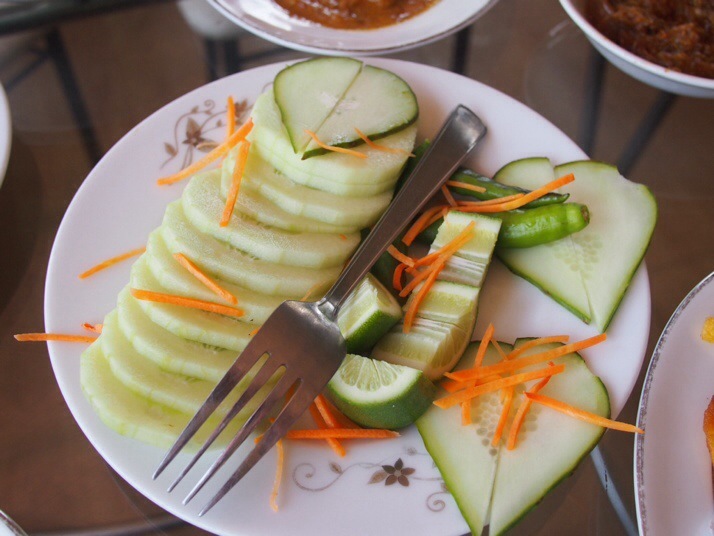 Both cucumbers and carrots are commonly sold on the street (peeled and partially split to form fingers) from big trays as a snack, usually with a hefty shake of salty spice. And a plain cucumber salad appears alongside pretty much every lunch or dinner meal for no charge – I definitely found it useful for reducing the burn on more fiery dishes! Cucumber side salad, just watch out for the raw chillis! A mixed vegetable curry (shobji) is a common dish served at breakfast time. Aubergines, cauliflowers, spinach and potatoes are commonly used as vegetables as well as a small bitter gourd type vegetable which looks a bit like a wrinkled up cucumber. On our first day in Dhaka we saw prepared pineapple for sale. 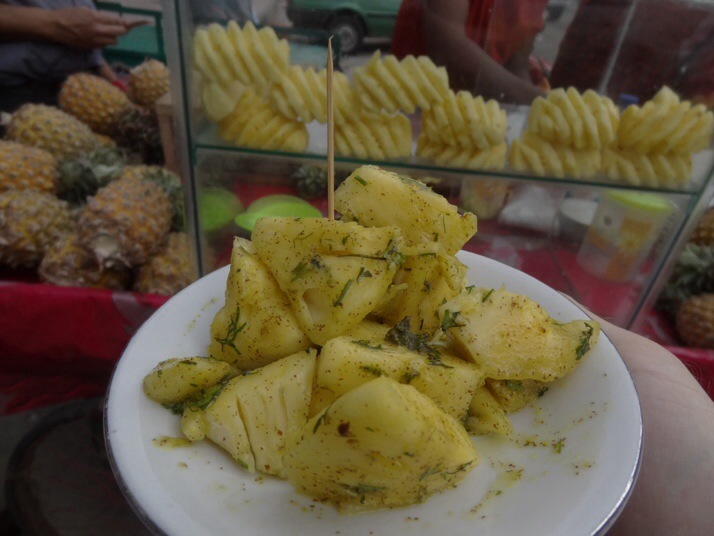 Coming from SE Asia where chopped fruit is commonly sold on the street we thought it would be a refreshing snack – we weren’t expecting it be shaken in a mustard dressing before being given to us – it was so potent that I thought it might have left a hole in my tongue! Otherwise fruit was widely available with bananas, oranges, and pomegranates all providing us with much needed vitamins. It’s just a shame that the mangos weren’t in season. Meat was either mutton (goat more often than sheep), chicken or occassionally beef. We didn’t seen any pork – it’s forbidden to Muslims. These are served in one of two ways, either with a curried masala sauce (of which there are different varieties but often only one at a time available in a given restaurant) or marinated and grilled as kebabs. Bangladesh sits astride the deltas of several enormous rivers. With that much water in the country it’s hardly surprising that fish is a staple. We saw stalls selling dried fish, but fresh seemed to be most common. It was usually served in a masala sauce but we also had it fried and grilled. 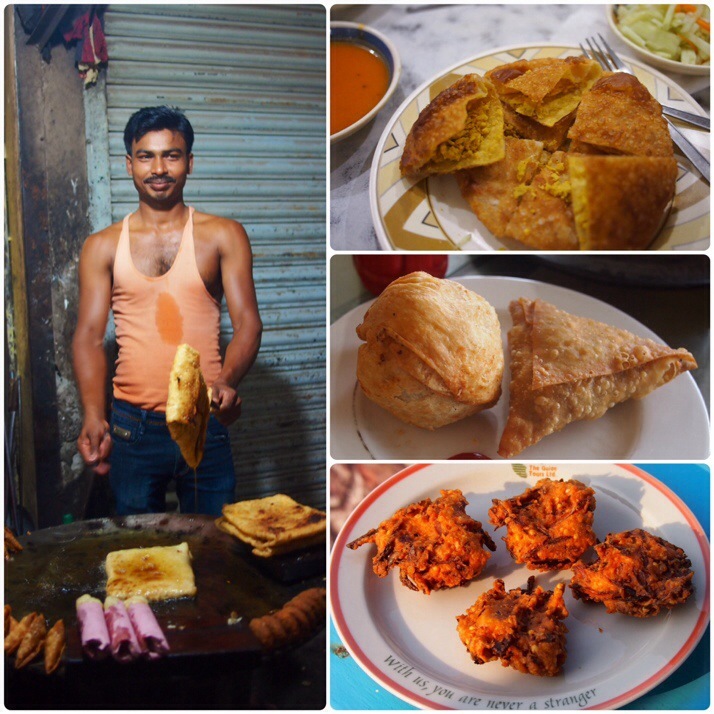 There are lots of different kinds of street snacks, usually a parcel wrapped up in dough and deep fried. Samosas and pakoras you might have heard of, but puri (saucer sized rounds with various fillings) and shingra (balls filled with a potato mixture) were new to us. A favourite of ours were mouglai, large sheets of dough wrapped around an often egg based filling to form a kind of flat envelope shape. Freshly cooked with the ubiquitous cucumber side salad they were a fast and filling light meal. 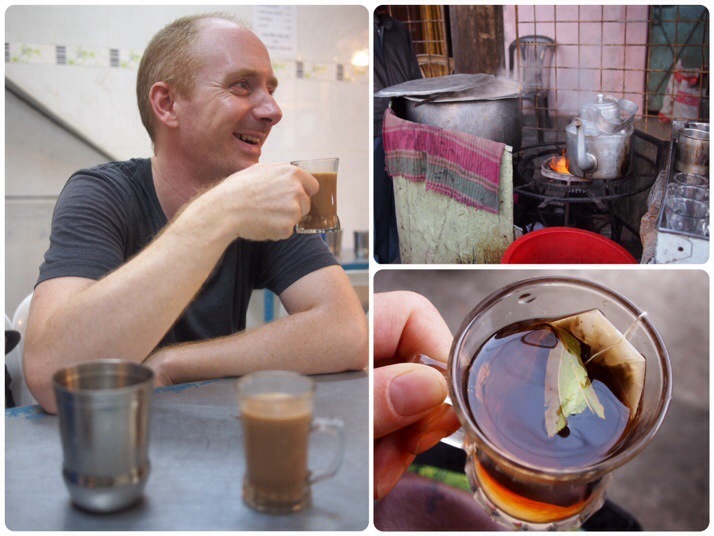 Tea (cha) is the drink of choice in Bangladesh. It’s served in small glasses from street stands everywhere. It comes in two varieties, one with milk (dudh cha) and one without (lal cha, literally red tea), both are very sweet. Milk tea is sometimes made with condensed milk, but is better when made with fresh milk kept at boiling point in a big pan next to the tea kettle. Black/red tea is sometimes pepped up a little with the addition of whole spices, we had at various times, a piece of root ginger, a clove, and a piece of Indian bay leaf. The tea is poured from the kettle over fresh tea leaves in a strainer and into the glass. Alcohol is not widely available in Bangladesh as it is illegal for Bangladeshis (or Muslim ones at least) to buy it. Many soft drinks are available in restaurants from the familiar Coke, Sprite and 7Up to less familiar local brands. 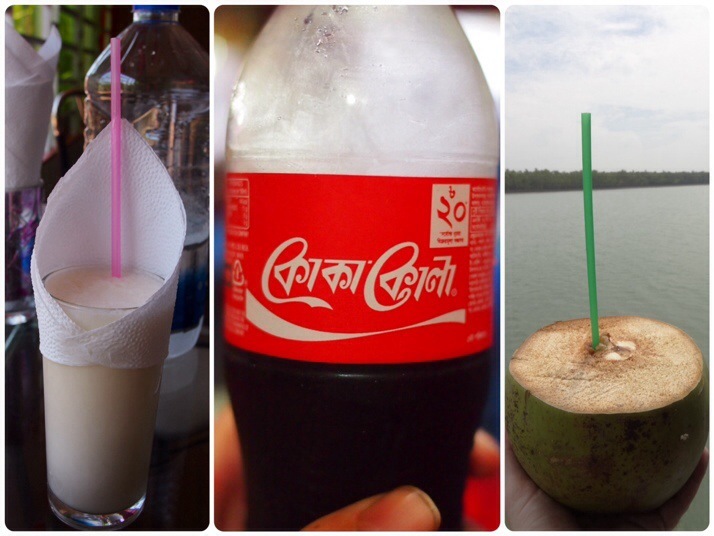 A more traditional local drink is lassi, made from yoghurt and served in sweet or salty versions. It’s a good way to cool your mouth down if your meal was a bit on the spicy side. 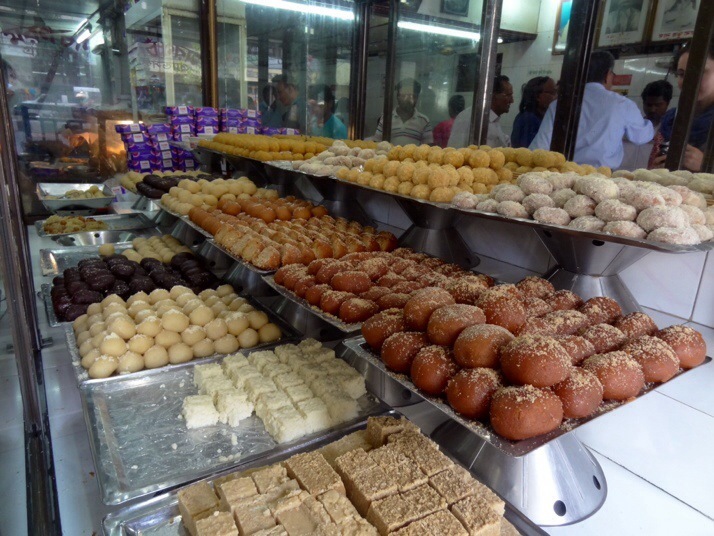 Bangladeshis definitely have a sweet tooth and traditional sweet shops are common in every town. 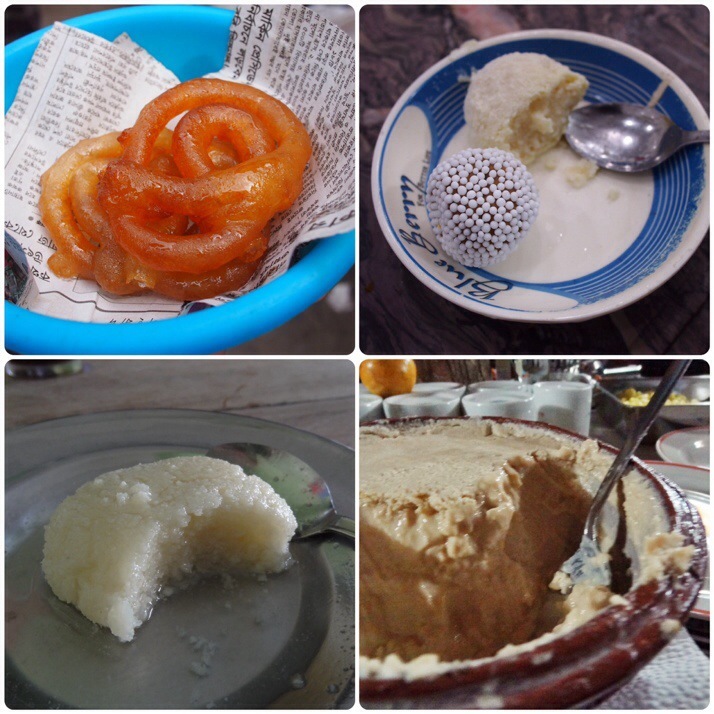 These sell lots of very sweet small cakes as well as sweetened yoghurt (misti doi) in clay pots – a favourite of ours! We also tried jalebi, deep fried dough swirls soaked in sugar syrup, for the sake of your teeth it’s probably best to only have one, but they’re very good. 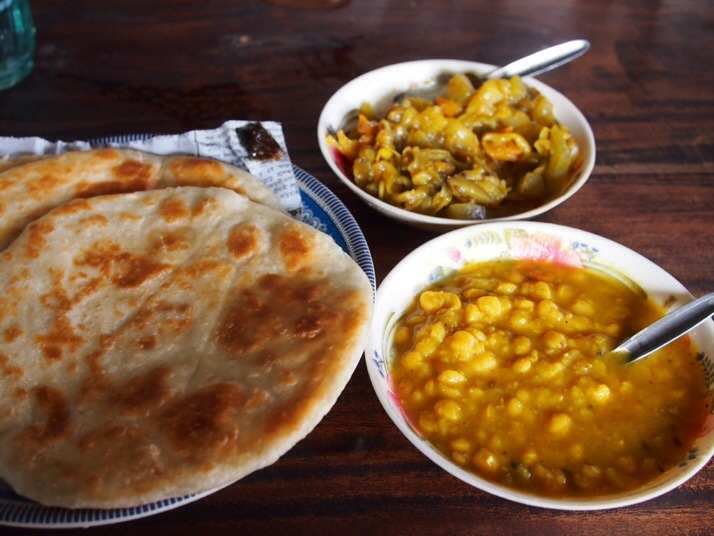 This entry was posted in Experiences and tagged Bangladesh, Food on April 18, 2014 by Julie. Heehee, you’ll have to get yourself a curry for your dinner tonight! Sadly in Seville on training camp, so no choice over food tonight. Probably pasta and some sort of random protein. Did you really taste that green chilli? i think if u took one bite, you would keep open your mouth for one minute! 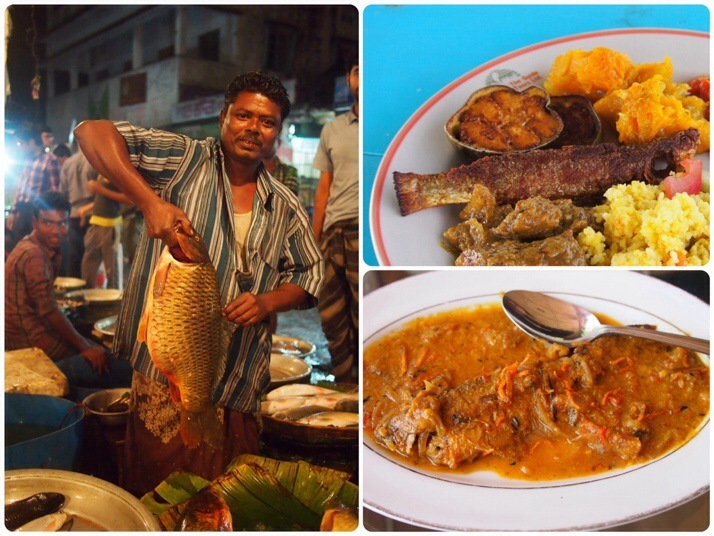 Bangladeshi food is delicious and the photos in your post are making my mouth water! WOW! you really are an adventurous foodie!! It seems you tried everything on the street! Even as a Bangladeshi I would not dare to do so with some of the dishes! I am so glad that you loved our food, I used think the same that our spice composition is more balanced within the region..but again thought may be I grew up eating these food, that is why I think that, good to know someone with a different taste bud thinks that too. Another thing came to my mind, in a continental cooking class when our instructor placed the complete dish of a half chicken, 4 pieces of grilled potato and some sauted veggie, I got worried how will I finish the chicken and veggies with such a small amount of carbohydrate! That day my perspective took a 180 degree turn. I understood how geography influences food habit! Being in delta we can grow rice twice/thrice a year and have access to an abundance of fish, thus it became our staple food… though we can have rice with just onion, roasted dry chili and mustard oil. That day I realize we have got rice common all the way from entree/amuse bouche to dessert. And the cooking actually finishes in the plate when you combined all the ingredients gravy/curry, protein/veggies, rice together as per your taste. That’s how no two can have the same meal. Thanks for your comment Nadira. 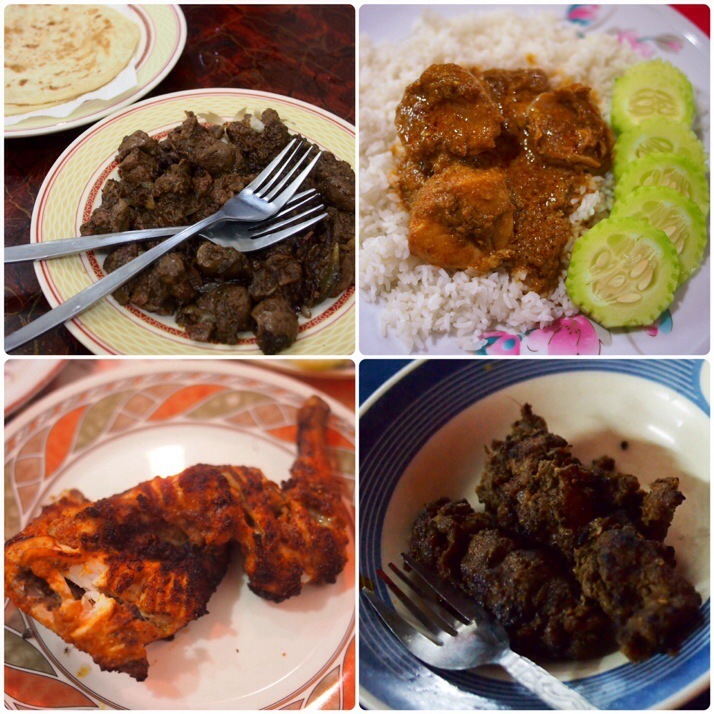 It’s making me hungry to reread the post and remember the delicious Bangladeshi food!